I was really discouraged earlier this week. I’ve been in a season of proverbial death for a few weeks, and as fun as that is, it does get a little old. 😉 Have you ever been there? If so, you can probably identify. Anyway, I’ve been hunkering down and getting alone with God, and He’s been helping me through. But the pressure has been intense. And the whole time, He’s been talking to me about right responses, about clean hands and pure hearts, and about the resurrection that is to come. And the other day, the Holy Spirit spoke this word to me that encouraged me so much. I thought it might encourage you today too. 1. I can’t control the storm. And that can be frustrating. When you have no control over things that are happening to you, you feel at the mercy of the storm. But you’re not. You’re at the mercy of God, and His mercies are new every day. 2. I can’t fix the storm. When unjust things happen, I can ask God to fix them, and He will. But I can’t fix them myself, so I feel helpless. But you know what? Even though I’m helpless to fix the storm, I can watch over the most important thing: my responses. That’s why I wrote Wednesday about responding rightly when you’re squeezed. Even if you can’t fix the storm, you CAN make sure that the only thing that comes out of you when you’re squeezed is the fruit of the Spirit. 3. But I can outlast the storm. 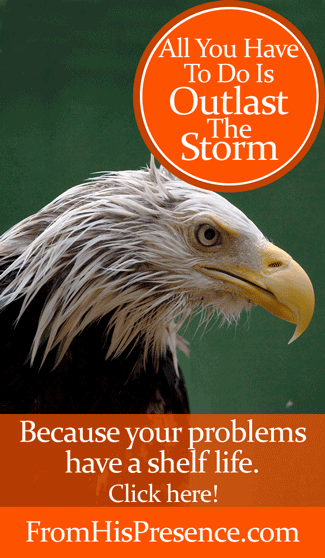 I love the eagle picture I used for today’s graphic/pin (pin it on Pinterest!) because you can tell that eagle has been under duress. He’s not enjoying the storm. He doesn’t look particularly happy. He is one wet, raggedy bird. I don’t have to know where it came from. I don’t have to understand why it’s happening to me. I don’t even have to think it’s right. All I have to do is outlast it. I can’t fix the storm. But, praise God, I can outlast it. Because I’m not going anywhere. The rain can fall all it likes. The wind can blow as hard as it wants to. But when all is said and done, by the grace of God, I’m still going to be here. I’m going to be right where I am (or higher), in my place, seeking God and doing what God has called me to do. Did you hear that, world? Come hell or high water, I’m NOT. GONNA. QUIT. So let the wind blow if they need to. Let the rains come if they need to. I’m going to hunker down in the shadow of the Almighty, and He’ll keep me safe through the storm. And all I have to do is get through it. All I have to do is outlast it. One breath at a time, one response at a time, one day at a time. And that’s all you have to do too. All you have to do is outlast the storm … because every storm in history has stopped sometime. There’s not a single storm that’s ever been, on the face of the whole earth, that hasn’t stopped. Not one. That means your problems have a shelf life. Your storm has an end. The winds of adversity cannot blow forever. And all YOU have to do is outlast the storm too. You don’t have to enjoy it. You don’t have to know why it’s happening to you. You don’t have to know where it came from. You ARE responsible for responding rightly. But if you will do that, all you have to do is outlast that thing … and the storm WILL stop. Eventually, whatever you’re going through will be over. The sky above you will clear. The sun will shine on you again. You’ll fluff your feathers and preen each one back into place. You’ll take to the skies one more time. And I’m willing to bet that you’ll be better off than you were before … because that’s just God’s way. Jesus Christ Himself promised that your storm is not without purpose. If you can just follow Him and outlast that thing, there will be a resurrection. You will bear much fruit. You WILL experience a harvest. All you have to do is outlast the storm. And, bless God, YOU can do that! Does this message encourage your heart today? If so, please leave a comment below. I’d love to hear from you! Image courtesy of Todd Ryburn on Flickr via Creative Commons license. Image has been cropped and graphics added. So powerful. It gives me confirmation from something else I just posted about being frustrated in the workplace. Your post helps me know that through God I have the power to weather the storm in all situations! Yes! His grace is sufficient. Thank you so much for reading! You’re going to get through this, and based on the Word of God, you’ll come out better than ever. Bring on the resurrection, Lord! 🙂 Have a great day! A very important encouragement to me today, Jamie. I have emailed you an update. Thank you for your faithfulness and discernment. Hi Laurna. Thank you. I received your email and have been travelling and unable to reply. But I did get it and I finally have a few minutes to reply today. 🙂 Anyway, I pray for you. I am happy to hear that Papa is working in your situation. I continue to lift you up in prayer as Papa has brought you to mind numerous times. Thank you for letting me know how things are going, and I’ll continue to pray. Hang in there, precious sister! Big hugs to you. Such a great word and paired with Prayer To Reverse Unjust Situations has given me the fortitude to smile and know God is going to turn this around! Thank you for great encouragement today!! God Bless you!! You are a mighty voice heard loud and clear!! To him who has ears to hear, let him hear.Thank you for speaking!! Praise God! I’m so glad this word blessed you, Tara, and thank you ever so much for your kind encouragement too! It means so much to me. Praise God for His omniscience and and power! I thank you for being such a willing and obedient vessel. This is so timely for me, and for others I’m sure. I almost let go last night, but I felt the Spirit say ” Hang on till the morning! Don’t quit!” Then I open my email to this rhema word sent from heaven. Thank You Father for this Your child. I pray that You would continue to pour out Your blessings on her right now, in Jesus’ name! Continue to speak to her and use her for Your glory and as a mighty warrior in Your kingdom. Your will be done in her, amen! 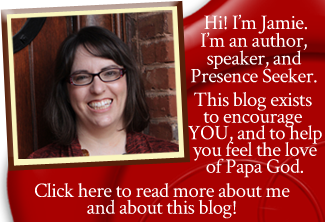 Thank you for reading my blog, and for sharing your story too! Sometimes I ask myself if you’re a magician Jamie. This morning I went to court and my case has once again been delayed to the 20th of July. When I came out I was angry and I asked God why I have to go through that. But by reading these recomforting words, it makes me happy and that the Lord Jesus is with me. He is definitely with you, Rafael. I encourage you to draw near to Him more every day. Ask Him to help you know Him better, and to feel His love and comfort. He will help you, and this giant will eventually look good on your resume! All things work together for good for those who love God, who are called according to His purpose! Thank you for sharing. I continue to lift you up in prayer to our Father. He will be your glory and the lifter of your head. Thank you, much needed encouragement. Feeling the squeeze. Thank you for this wise post. So very much truth here and an encouragement for all. It is my guess that we all go through this, some more often than others. I love to be reminded how to get back on track. Such great truth here! A great encouragement for when I find myself in the middle of the next storm. So glad I stopped over from Titus 2 Tuesday. Hi Archana, wow, that is so amazing! Thank you SO MUCH for letting me know! Jesus is so good! I’m so grateful that He touched you like that. Thank you for reading, and thank you for sharing your testimony! Thank you for this very timely encouragement Jaime!! While I don’t think in terms of religion, and one being right or wrong, I definitely believe in God, the Holy spirit, Jesus, etc. I find what you write to be comforting and it resonates with me in a way I’m deeply thankful for. Thank you! Good bless you and your family. Thank you for this timely word. I will hold fast to his promises. be blessed for encouraging the body of Christ.